Omega and James Bond have had a fruitful partnership, spanning (almost unbelievably) over twenty years, ever since Commander Bond was first issued with an Omega Seamaster 300m Quartz for 1995’s “GoldenEye”. For the subsequent Pierce Brosnan films, Bond was issued with an automatic Seamaster Diver 300m, featuring an array of armaments and functions to help get 007 out of some tight scrapes. 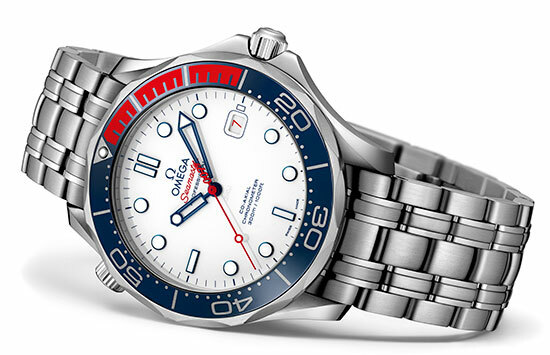 In 2006, Daniel Craig, the new incumbent 007, also sported the Seamaster Diver 300m co-axial for “Casino Royale”, in which he also wore a Seamaster Planet Ocean 600m co-axial. The Planet Ocean returned on a steel bracelet for “Quantum of Solace” and in “Skyfall” Bond added the Seamaster 150m co-axial Aqua Terra to his collection. 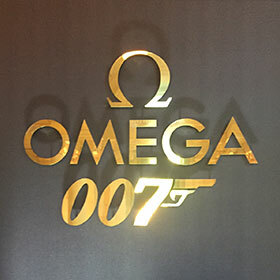 Above: Items from the EON archives chart the history of Bond's relationship with the Omega brand. These watches, mercifully, simply told the time, but for “SPECTRE”, an entirely new and limited edition wristwatch was created for the film, the Seamaster SPECTRE 300m, utilising the most up-to-date watchmaking techniques, but with a distinctly retro design ethic. Incredibly, considering the nature of Bond’s past timepieces, this was the first wristwatch in 13 years that was also a Q-Branch gadget. 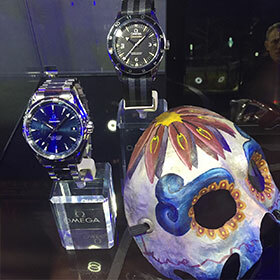 Additionally, over the years Omega have released a number of limited edition Bond watches to tie-in with the films, and on the evening of July the 5th, Omega launched the latest watch to commemorate this long-standing association: The Commander’s Watch. The Seamaster 300m Commander’s Watch is something of a surprise in that rather than being understated, as one might expect of a James Bond watch, it is certainly flamboyant. 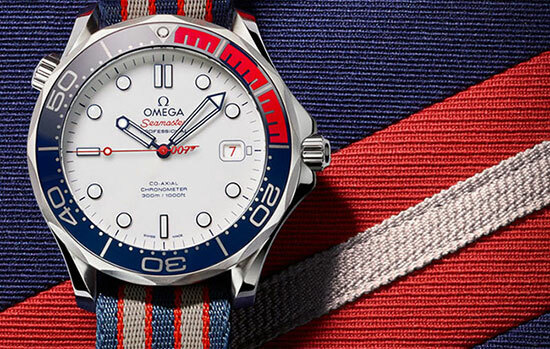 However, there is reason behind this splash of vibrancy as the red, white, grey, and blue colour scheme of the bezel, dial, and NATO strap, represent the colours of the Royal Navy. Above: Commander's Watch with Bracelet Band. The Bond association is relatively subtle, confined to a small 007 logo on the red second hand, a red 7 date marker, with the addition of a three-strip commander’s insignia and 9mm bullet motif on the rotor, which can be viewed through the watch’s exhibition caseback. The launch of the watch was certainly a Bondian affair. The Tate Britain, directly opposite the (remarkably still intact) MI6 headquarters at Millbank, played host to the launch, with guests walking the red, grey, and navy carpet to the music of the films, into a space positively crammed with delights from the world of 007. Guests were greeted by impossibly beautiful servers, who had somehow slipped from the world of James Bond into our own, proffering canapés and champagne, whilst a dedicated Martini bar was on hand to mix up 007’s favourite tipple. Eon archivist Meg Simmonds had done a sterling job, with costumes, props, and artwork spanning the entire fifty-five year franchise on display throughout the space, with a special row of cases featuring the Omega watches and props from each film. Special guests included some of the biggest names from the world of James Bond, including producer Michael G. Wilson, costume designer Lindy Hemming, production designer Peter Lamont, and former Miss Moneypenny, Samantha Bond. Samantha Bond acted as master of ceremonies, whilst introductory speeches were made by Michael G. Wilson and Omega CEO Raynald Aeschlimann. Finally, a drumline beat a rousing tattoo as the time came to unveil of the watch. Above: Commander's Watch with NATO strap. Aeschlimann revealed there are three iterations of the Commander’s Watch, one stainless steel, and two in gold. The stainless steel watch will be limited to just 7007 pieces and the special gold edition will consist of only 7 pieces. The stainless steel edition numbered 007/007, one of the limited gold editions, and a single white gold piece (the only one of its kind) will be auctioned for charity later this year. Whilst this is an official 007 watch, it is unlikely we will see it on the wrist of Commander James Bond any time soon. 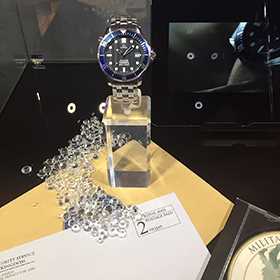 However, for those of you with horological inclinations (and a spare €4,600 to spare), the Commander’s watch is a must for completing your 007 collection.